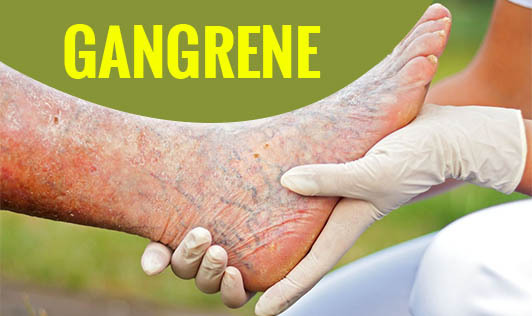 Gangrene refers to the death of body tissue due to a lack of blood flow or a bacterial infection in a particular area in the body. It commonly affects the extremities including fingers, limbs, and toes. However, it can also affect your internal organs and muscles. One's chances of developing gangrene are higher if he or she has an underlying condition such as atherosclerosis and diabetes. This can result in damage to the blood vessels and affect blood flow. Severe pain followed by a feeling of numbness. Foul smelling discharge leaking from a sore. Skin discoloration ranging from purple, blue, black, bronze, or red depending on the type of gangrene one may have. The tissue that is affected is painful and swollen. He or she may suffer from fever or feel unwell. On the other hand, a condition called septic shock can occur if a bacterial infection that originated in the gangrenous tissue spreads throughout the body. If you have diabetes, make it a point to examine your hands and feet daily for any cuts, sores, and signs of infection such as swelling, redness or drainage. Get yourself examined by a doctor at least once a year. Don't use tobacco because tobacco products can damage your blood vessels. Lose weight because excess pounds not only puts you at risk of diabetes but also places pressure on your arteries constricting blood flow, increasing the chances of infection and slowing down wound healing. Wash your hands with mild soap and water, and keep them dry and clean until they heal. Note that whenever the temperature drops, a frostbitten skin can lead to the formation of gangrene since frostbite reduces blood circulation in the affected area. If you notice your skin has become hard, cold, pale, and numb after exposure to cold temperature, call your doctor immediately! Contact your doctor right away if you have symptoms of gangrene!